Copyright © 2018 Eltham Little Theatre Ltd. All Rights Reserved. 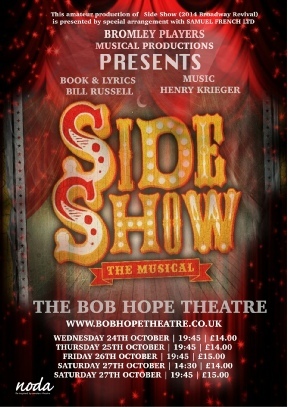 Bromley Players are excited to be presenting Side Show, a musical based on the life of conjoined twins Daisy & Violet Hilton. With echoes of the hit film “The Greatest Showman”, the show tells the story of the pair who were born in Brighton in 1908 but ended up in America. There they became among the biggest stars in Vaudeville, earning their manager more than $5,000 a week ($65,000 today).